We can all improve our learning environments by sharing and borrowing great ideas. How do you share online? What are your favorite sites for borrowing from? Use the Post Comment link to share your thoughts. Bonus: Take this challenge to share content on Digital Is. karen Aug. 14, 2012, 5:56 p.m. There are other places I share less frequently...Writing.com, Google Plus, Vimeo, YouTube, Curriki, etc. #1 is definitely Flickr. They have over 234 million open licensed photos that you can freely borrow. Here are some of my favorite education sites to borrow from. Tellio Aug. 14, 2012, 10:45 a.m.
Flickr is one of my oldest spaces for seeking, sense making, and sharing. I have been using it since before it was owned by Yahoo. 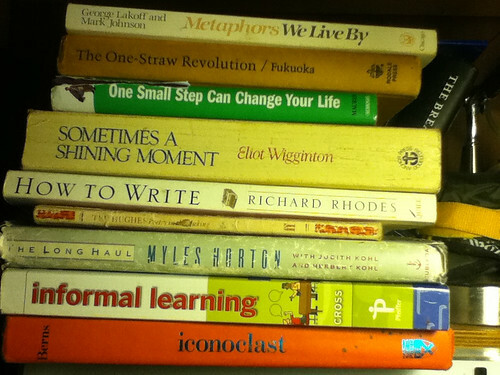 Here is a bit of my learning credo as demonstrated with books on Flickr using the annotation feature. Just click on the picture and it will take you to my Flickr photostream with the annotation in mouseover boxes. Thanks for reminding me to use this for sharing. I also use it for my whiteboard to share assignments and agenda with students. Valerie Burton Aug. 4, 2012, 8:26 a.m.
Tellio Aug. 14, 2012, 10:55 a.m. In Reply To: Valerie Burton Aug. 4, 2012, 8:26 a.m. It would be very cool to know how you manage your workflow for this image. How does a typical workflow path work for you? And how does 'connection' fit in?